Just a few days ago, my co-author Deborah Bolnick and I published a paper in the journal PaleoAmerica on the subject of haplogroup X and Native American population history. Rather than writing a blog summary of it (which has been my usual approach for publications), we decided to try something different: make the paper itself open access and respond here to a few questions about it that we’ve seen from a variety of sources. We hope that this approach will be helpful to interested readers! We reviewed existing genetic data to answer the question: Could mitochondrial haplogroup X2a have been brought to the Americas by an ancient trans-Atlantic migration? This is a rather old question from the perspective of anthropological geneticists, but we’ve seen it appear in both academic publications and documentaries rather frequently. We thought it was worth revisiting in light of recent genetic publications. Quite simply, we found that mitochondrial and genomic data do not support this migration hypothesis as the most plausible explanation for X2a’s presence in North America. Instead, the most parsimonious interpretation of the genetic data continues to be that haplogroup X2a had the same migration history and ancestry as the other founder Native American mitochondrial lineages (i.e., from Siberia). Based on the current evidence, we feel that there is no need to invoke a distinct origin for individuals bearing this lineage. If’ you’d like another summary of the paper, Andy White wrote a very good blog post about it here. How can you say that this proves once and for all that all Native Americans have exclusively Beringian ancestry when you haven’t sequenced all of them? Isn’t that unscientific? It is of course possible that genetic evidence of an ancient trans-Atlantic migration event simply has not been found yet. Should credible evidence of direct gene flow from an ancient Solutrean (or Middle Eastern) population be found within ancient Native American genomes, it would require the field to reassess the “Beringian only” model of prehistoric Native American migration. However, no such evidence has been found, and the Beringian migration model remains the best interpretation of the genetic, archaeological, and paleoclimate data to date. We don’t think it’s likely that new evidence will suddenly crop up showing another source of ancestry for Native Americans, but it remains a formal, albeit remote, possibility. Should such evidence be found, it will require us to reexamine our models. But we can’t incorporate hypothetical results into our interpretations. That would be unscientific. Doesn’t skeletal data contradict the Beringian hypothesis? What about the very early Paleoindians whose skulls look physically different from later and contemporary Native Americans? Aren’t they proof that Native Americans have European ancestry? The skeletal data show changes over time in the cranial morphology of ancient Native American populations. It’s true that comparisons of skull shapes were, for a very long time, how anthropologists studied genetic relationships between populations. However, over the last few decades, we’ve developed the technology to assess biological relationships between individuals and populations by comparing genomes. It’s generally acknowledged that this is a more precise, direct means of assessing ancestry than morphology, which can be influenced by environmental, developmental, and cultural factors. Furthermore, the genomes of several of the Paleoindians with differently shaped crania have been examined, and they show no evidence of different ancestry than later or contemporary Native Americans. For example, Kennewick Man, who we discuss in the paper, exhibited what some have described as “Caucasoid” cranial features. However, his overall genetic affinities group him with Siberians/East Asians, not Europeans. And his mitochondrial haplogroup is the most basal lineage of X2a so far observed. This result shows that X2a—and this Paleoindian cranial morphology—are compatible with Siberian ancestry. Why the skulls of the earliest inhabitants of the Americas look different from the later indigenous inhabitants is a very interesting question. We suspect it has to do with evolutionary forces like selection or drift acting on morphology over millennia. Current genomic research just doesn’t show evidence that they had different ancestry from later Native American groups. Isn’t it pretty well proven that Clovis technologies are descended from Solutrean technologies? No. The majority of archaeologists think that the similarities between the Clovis and Solutrean points are either spurious or coincidental. Very, very few archaeologists interpret the data as supporting the Solutrean hypothesis. We don’t see the genetic evidence as supporting the Solutrean hypothesis either. Archaeologists were wrong about the “Clovis First” hypothesis, so doesn’t that mean that you’re wrong too? Why? These are two separate models. The model of Beringian genetic ancestry of Native Americans is not dependent on the Clovis First hypothesis; in fact, the same evidence from which the “Beringian Pause” model was developed—early coalescence dates of mitochondrial lineages and ancient DNA data—was an important component in overturning the Clovis First model. In science, any hypothesis is falsifiable, and any model is provisional pending contradictory data. The overturning of the Clovis First model is a great example of the process working as it should. Isn’t it unfair to critique the Solutrean hypothesis before it’s been fully “fleshed out?” There’s bound to be more data supporting it soon! Any hypothesis is open to testing, otherwise it’s not scientific. And there’s no “waiting period” to protect a hypothesis until it’s gathered enough data to make it immune to criticism. This argument is a species of special pleading—no other idea in archaeology is treated this way. What about the signal of “West Eurasian” ancestry seen in Native American genomes? Does it support a trans-Atlantic migration? This finding has led to a lot of confusion among non-geneticists, and we address it in some detail in the paper. To summarize: Raghavan et al. (2014) and Rasmussen et al. (2014) studied the genomes of the Siberian Mal’ta individual and the Anzick-1 individual, respectively, and they found that a portion of their ancestry (between 14-38%) was derived from a population that also contributed alleles to the contemporary inhabitants of West Eurasia. Notably, the contemporary European gene pool appears to have emerged quite recently—within the last 8,000 years—as a result of significant migration and admixture events. We don’t know what the genomes of Solutrean peoples looked like, since none have been sequenced yet, but from these findings we predict that they would more closely resemble pre-Neolithic hunter-gatherers than contemporary Europeans [see Allentoft et al. 2015, Haak et al. 2015, and Lazaridis et al. 2014]. Importantly, based on the pre-Neolithic genomes that have been studied, it appears that these early European hunter-gatherers did not exhibit close genetic affinities to Native Americans. was one in which the population ancestral to Native Americans was derived from ancient North Eurasian and East Asian sources, while contemporary Europeans were derived from ancient North Eurasian and West Eurasian sources. In other words, gene flow was from the ancestral North Eurasian population into both the ancestral Native American and ancestral European populations. Lazaridis et al. (2014) did not find any evidence of Pleistocene gene flow directly from West Eurasians into Native Americans. Their model is also consistent with other studies, which have shown that 62-86% of Native American ancestry derives from East Asia. We’ll update this FAQ with the answers to more questions as they arise, so do check back. If you have any questions, feel free to leave them in the comments section and we’ll try to get to them as soon as our schedules allow. Nicholas Wade has a problem. 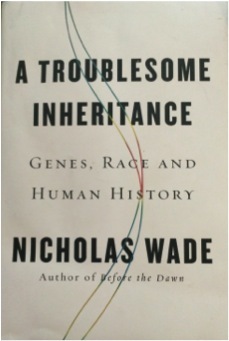 Although his new book, “A Troublesome Inheritance: Genes, Race and Human History”, appears to be selling well, he’s not encountering the praise that he expected from biologists for “courageously” freeing them from the “intimidating social scientists” on the subject of race). Raff and Marks take issue with one of these surveys, Rosenberg et al. 2002, which used a computer program to analyze the clusters of genetic variation. The program doesn’t know how many clusters there should be; it just groups its data into whatever target number of clusters it is given. When the assigned number of clusters is either greater or less than five, the results made no genetic or geographical sense. But when asked for five clusters, the program showed that everyone was assigned to their continent of origin. Raff and Marks seem to think that the preference for this result was wholly arbitrary and that any other number of clusters could have been favored just as logically. But the grouping of human genetic variation into five continent-based clusters is the most reasonable and is consistent with previous findings. As the senior author told me at the time, the Rosenberg study essentially confirmed the popular notion of race. It’s not a question of logic, but rather what the data show. Rosenberg et al. (2002)’s paper did not analyze or identify just 5 clusters, but rather it considered 1-20 clusters. What Wade is omitting from his paragraph above (and also from his book) is that Rosenberg and colleagues never presented any statistical justification for the choice of 5 clusters over any other number. When Andy Hurley performed with Fall Out Boy for the 2013 Victoria’s Secret fashion show on November 13th, he was given a costume to wear that included a shirt with the Rising Sun on it. The Rising Sun symbol, used by the Imperial Japanese Army during World War II, has come to represent horrors of wartime aggression (such as the Nanking Massacre) to many, particularly South Koreans and Chinese people. The Rising Sun symbol is horribly offensive to descendants of people affected by these events, much like the Nazi Hakenkreuzflagge or the Confederate flag. Yet unlike those symbols, it continues to be used widely. Many people simply don’t understand the connotations of this symbol. But after he was made aware of it, Andy and I felt that this incident would provide a good opportunity to heighten awareness of its cultural context. Here are his thoughts. 1. Evolution has made men naturally more “aggressive and tough”, and women naturally more “compassionate and domestic”. 2. Therefore in the modern world, as in past societies, men are the natural breadwinners, and women the natural caretakers of the home/children. 3. Going against these gender norms, as feminism has done in the last few decades, is going against nature, and disrespectful of the importance of childcare! The antiscience trend in anthropology in recent years has, and continues to have, devastating effects on the lives of indigenous peoples…Indeed some current anthropological schools of thought have completely abandoned the idea that truth exists at all, and instead insist that each version of history is equally valid. This “postmodernist” perspective has been widely adopted by both academic anthropologists and some human rights agencies. Although we sympathize with a perspective that much of history that is actually propaganda that serves the interests of those who write it, the denial that any truth can be discovered or documented must be rejected as both naive and dangerous. Indeed, nothing could be more devastating to native peoples than a perspective that logically maintains that indigenous suffering can simply be considered another “version of history.”…An antiscience trend in recent anthropology is robbing indigenous peoples of this basic human right. Many thanks to my friend and colleague, Dr. David Samson, for this.